"Meh!" said my lead salesman, "the stock sync cable is good enough. All you ever do is connect your Treo, push the button, and after it's synced, leave it connected until it's also recharged." So I reminded him about all of the twisting and turning he usually does whenever his own Treo goes off (appointment reminders, To-Do reminders, alarms, etc.) while it's connected to the sync cable. That caused a frown. Like I told him, a cradle for your PDA or Smartphone is a handy thing to have. The BoxWave Treo 650 cradle is one of a huge line of sync/charging cradles for a massive range of PDAs and Smartphones. 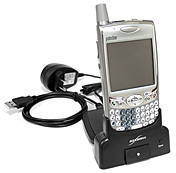 This one is a USB device designed specifically for the Palm/palmOne Treo 6oo/650 series. The cradle is a desktop device with front mounted LED and separate sync button. The cradle receiver provides a close but easy fit for the Treo. Just like a sync cable, these cradles are passive to the system they're attached to and don't require any software or drivers. The cradle can be connected to a Mac or PC. So what's the fuss about a cradle? Not much really, except for a neater desk and better device usability while it's mounted in the cradle. That should be enough for most of us, and in fact those two reasons are the whole point. If you don't care, don't bother with it. On the other hand, once you get used to it, going back to a plain old cable is unpleasant. One thing leads to another, as usual, and some people find themselves using their Treo in the cradle whenever they're at the desk mainly because the Treo screen is much easier to see and read (appointments, to-do's, memos, etc.) than when it's lying flat on the desk reflecting glare into your eyes from the ceiling lights. Cons: The only additional feature this cradle needs is a quick release mechanism of some sort for the complicated Treo connector. Just as with the sync cable, you have to give the Treo a good pull to release the pressure fit connection tabs in the cradle. Because the cradle provides a close fit for the Treo 650, you have to remove the Treo from any case you're using. Cradles for some other devices, some PDAs notably, are designed to let the devices remain in their cases while docked. It all depends on the model and case design. Pros: Being able to access all of my Treo 650's features while the device is in an upright position in the cradle, as opposed to having to flip it end for end when it's typically attached to a sync cable is well worth the price for this thing. It's well made, formed from medium and heavy gauge plastic, and the device mounting tolerances maintain ease of use. Although this review is clearly about the Treo 650 cradle, it applies to all the other BoxWave device cradles. If you've got a PDA or Smartphone and you're aggravated by the stock sync/charging cable, check out one of the BoxWave cradles. Recommended.